For five years of exerted effort, blended sweat and blood by all the agents, staff and the broker, just to serve all the clients; the RPM Realty is now celebrating its 5th Anniversary in the Service, this afternoon, October 20, 2010. This is another annual success for each personage in the office, who showed and who still show the good service to every client that the office has. 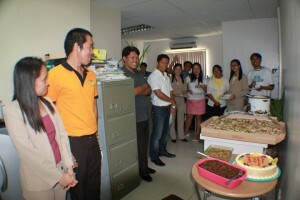 As part of the office’s events, this is another memorable one for each of us. 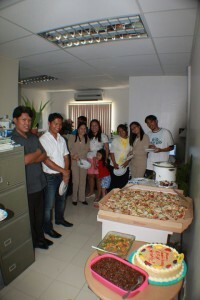 We have this “salo-salo” in the office, which we enjoyed a lot; together with our architect, broker and his ever supportive wife, and of course, the Homechoice Planners & Construction Corporation’s staff. The celebration is quite simple, but copiously done with the bountiful boons from God, as well as the continued good rapport among each of us in the office. This is what matter most in a group or organization- The Team Building and the ever support that could be observe within each of us. We would like to extend our gratitude also, to all of those past agents, who’d been part of RPM realty; for their exemplary acts and shown effort, which contributed much to the realty during their times. Of course, also for the present agents, web masters, and staffs, thank you for being very eager, lively, supportive, hardworking, understanding and open-minded to do your tasks and of serving all the clients in the best that you can. I, will also affirm everyone of us, for our dedication and for being firm to our commitments and for acknowledging God as our proprietor of everything we are doing in the business or on the job we are line into. Thank you for those people in the office who are that true to remind each of us to be good and focus on our connection with the Lord, while doing our job with our clients. Thank you and congratulations to all of us in RPM Realty, together with the CDO Realty for another year of success!